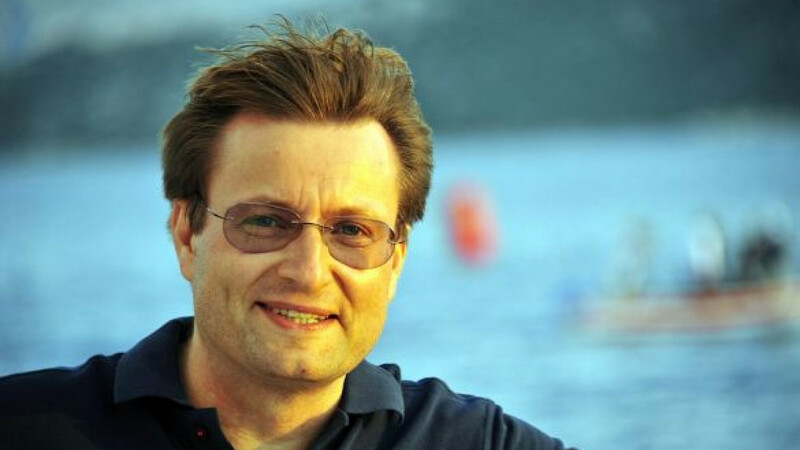 SOGUT, Turkey — When speaking about business, Denis Petrunin lards his speech with sailing terms: An economic crisis is like a storm, and companies are ships braving the wind and waves. The comparisons are not accidental. Petrunin, 45, who is now managing director of Hyundai in Russia, was talking over breakfast on a sunny terrace at a waterfront restaurant in a provincial Turkish town, where he and his colleagues stopped overnight during a corporate regatta in early September. Favorite Moscow restaurant: Cantinetta Antinori (20 Denezhny Pereulok). It’s located in the house that belonged to my great-grandfather before the revolution of 1917; I was born and spent my childhood there. Petrunin, who invited a dozen of his managers to join him in a race against other corporate teams for six days on the Aegean Sea, prefers active leisure, saying that he hasn't had a classic beach holiday in 10 years. Canoeing, volcano climbing, skiing, cycling — that's what an ideal family vacation should consist of, he says. But Petrunin, who cycles every weekend, said he is not ready to swap his car for a bike to get to work. A passionate driver, he said a car actually helps him cope with everyday stress. "I enjoy driving. I can drive 4,000 to 5,000 kilometers when I'm on vacation with family," Petrunin said. But the biggest pleasure for him is driving around Moscow after the first chill in the late fall, coping with skids on turns. "I always look forward to this time and race. It's such a childish joy," he said, adding that he intentionally leaves his office in Moskva-City late to drive around the empty streets. Ironically, Petrunin, who has fond memories of the first car he owned — a Lada made by AvtoVAZ for export and then brought back from Belgium — hasn't owned his own vehicle since 1995, the year he started working in the automotive industry. He has been using company cars provided by his employers: BMW, Volkswagen and now Hyundai. In 1995, Petrunin sold his stake in a firm managing a private customs terminal when he was invited to join BMW Group Russia. He found himself following in the footsteps of his father, who worked at the ZiL truck assembly plant in the Soviet era. "I've been close to the automotive business since childhood, as my dad worked at ZiL for 25 years, and industry issues were much discussed in our family," Petrunin said. "We were always talking about why the assembly line had stopped or how the plant with a capacity of 60,000 vehicles a year could double that amount and how that affected quality," he added. The invitation to join BMW came as a surprise, but Petrunin said he didn't hesitate. "It was very interesting. In 1995, BMW sold 500 vehicles a year in Russia and it was a great result. It was crazy," he said. Things have changed since then, with Russian car sales booming last year to reach 2.6 million, up 39 percent from 2010, according to the Association of European Businesses, with BMW selling 30,167 units in 2011. The company, which assembles cars at the Avtotor plant in Kaliningrad, expects to sell about 35,000 vehicles in Russia this year. Over the last few years Russia's burgeoning market has seen a flock of foreign carmakers — like Volkswagen, Nissan, and Toyota — set up local manufacturing. And even as talk about the second wave of an economic crisis doesn't subside amid the uncertainty in the European market, Petrunin remains optimistic, saying that the Russian automotive industry is much better prepared for shocks than during the crisis of 2008 to 2009. "The previous crisis was like a storm that sank some big non-resilient ships, as well as the smaller ones," he said, referring to the companies that went bankrupt. "Those who survived stayed afloat." Q: You joined Hyundai in 2008, right before the global economic crisis. What was the most difficult moment for you and how did you resolve it? A: It was the time when we just started construction of a Hyundai plant in St. Petersburg in July of 2008, and we were approached by the company's headquarters asking for advice on whether to suspend the project or move forward. No one knew at the time how deep and long the crisis would be, so I could count only on my knowledge of the market. The plant was set to produce C-class vehicles targeting primarily the mass segment, and I felt that we would be able to compensate production costs by attaining good sales volumes. So I was asking the head office not to freeze construction, and I secured a positive outcome. The project was completed, and we opened the plant in September 2010. The reward was not long to come, as then-Prime Minister Vladimir Putin, who attended the opening ceremony, said the plant met the government's expectations in terms of the quality of equipment and the level of production localization. But the slump wasn't so dramatic in 2008 — the retail business was in rather good shape and even made profit. Dealers had full warehouses, because the demand was strong, and when it started weakening in the fall dealers were selling out their stocks. The real challenges began in March of 2009, when the actual slump started. The Hyundai brand was not as strong in Russia as it is now, and it was hard to remain attractive for business partners. The only option I saw was traveling to the regions to meet with dealers, who were under stress as well. Many dealers had started building retail centers before the crisis and had to pay out big loans. So we met with our key partners to weigh our options: who could resist the crisis and who was in dire straits. Talking to people helped us to understand perspectives. The biggest challenge for me personally was that joining a new company coincided with the crisis and a high level of uncertainty. I had been working with Germans for 12 years before, and moving to a Korean company was stressful, because I had to get used to a different management style, to understand my new business partners the right way, because it was a different mentality compared to what I saw working with German carmakers. Q: What is the main difference between the two business cultures? A: A strong point of Korean companies is prompt decisionmaking. German automotive companies lose out to Korean peers in the speed of decision making because of their heavy structure including supervisory boards, boards of directors. Germans need a lot of time to make strategic decisions, while Koreans are much faster thanks to the peculiarities of their mentality. Korean carmakers benefit from their authoritarian approach to decision-making: They don't need to convene a board of directors to discuss issues; it's the company's owner who has the final say. I can say that even on my managerial level I can approve my decisions with the head office faster compared with my experience in other companies. It's most valuable in a crisis, as fast decision-making allows for reducing losses and to find better solutions. Long-term strategic planning doesn't work during a crisis. Q: How does your scientific background help in doing business? A: A scientific education helps to quickly assess chances and risks. You get used to working with numbers, and it's numbers, not emotions, that business works with. When you analyze options, you use calculations and see what's going to work out and what isn't going to work out. Q: How does uncertainty in Europe affect the Russian auto industry? A: Russia benefited from declining sales in Europe. Weak demand in Europe allowed carmakers to ship unwanted vehicles to Russia, which is a high potential market. As far as Hyundai is concerned, demand for our cars exceeds supply globally. Our manufacturing facilities across the world are stretched to the limit, so we can get additional vehicles for the Russian market only when demand in other markets slows down. For example, last year we imported approximately 800 iX35 cars a month; now we get about 2,500 because of the crisis in Europe. Overall, Russian car sales are expected to grow by 8 percent to 10 percent this year. Q: What's your view of how to resolve Russia's traffic problems? A: Tackling the problem of traffic jams is a global task for Russia, where most of the affluent population is concentrated in big cities like Moscow and St. Petersburg. Look at other countries where the population is evenly scattered across the territory, and the purchasing power is more or less the same across the county. In Russia, the population is concentrated in a couple of metropolitan cities. We should attract investment to the regions and make them attractive for people to live. That might help to reduce the concentration of people in Moscow. Reducing concentration will help to relieve traffic. Incidentally, it looks like this winter will be rather hard for Muscovites in terms of traffic jams. The construction of numerous elevated roads has started this year on almost all highways, so we are likely to see a lot of traffic jams. Q: Could Moscow use the experience of some world capitals where vehicles with even numbers are banned from entering the city center on odd dates and vice versa? A: Do you know how people in Greece deal with the ban? They buy two cars with different numbers. The number of families that own two vehicles there is above 50 percent. The same is true in China: People have two cars — one in good condition and one older one. If you want to boost the automotive industry you can introduce the ban. It will give a strong impetus to the market, because people will have to buy two cars to drive somehow. But it's hard to imagine that this will relieve traffic. It could happen for some time, but the real effect would be in stimulating demand. The benefits for carmakers are doubtful as well. On the one hand, the measure would boost sales, but you should understand that the market will end up getting saturated, and the slump will be stronger, because the bigger growth is, the harder decline will be. A: I get inspired by my work. It provides opportunities for self-fulfillment, and you enjoy it when you achieve goals. And the very process of achieving is perhaps a bigger pleasure than the result. I'm inspired by the example of my parents. They are 75, but they still work and don't even think about retirement. They run a small business and go to work every day. They can't live without work and are very cheerful and active. Dad has always been hardworking. At ZiL he started as an engineer and later took various managerial positions. He took me to the plant sometimes, but one of my best childhood memories is attending May 1 and Nov. 7 demonstrations. ZiL was a big plant, and its employees were marching in a big group. I liked marching with other kids, holding paper flowers, towards Red Square. There are no such demonstrations anymore, only political ones.